Handiwork - Just for Fun! New Lesson for This Weekend! 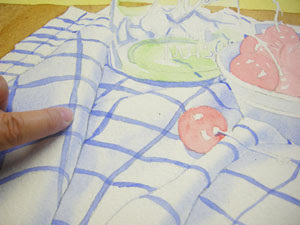 Today I am going back to the French Ultramarine Blue and using a very wet wash of color on the folded edges of the towel. As before, I am using my Softened Edge Stroke (see previous posts) to create a soft edge where I don't want a crisp line in the color. Pay attention to the lightness and darkness (values) of the different shadow areas. The shadows will be darker on one side. There is also some light bouncing around the objects. Squint your eyes to see the different values. In your photo references you will see that one photo is printed in black and white. This also helps to identify the subtle, different values throughout the piece. Don’t have the references? If you would like to paint along with my blog lesson, you can get the photo references and drawings sent to you by visiting my etsy shop, clicking on the Online Lesson icon, and pay a small fee of $5.00. I will then email the to you the photo references and the drawing.